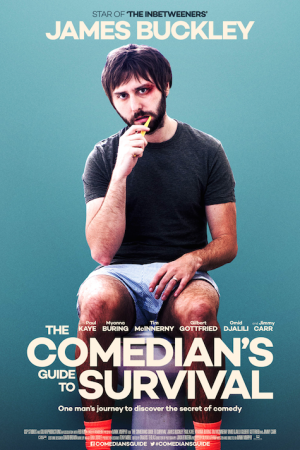 The Comedian’s Guide to Survival follows failed stand-up comedian James Mullinger, who is most famous for a viral Youtube video depicting him wetting his pants on stage. He is at a cross roads in his life and must face an ultimatum set by his boss, the editor of GQ magazine. He must take a promotion and never do stand up again or, stick to the comedy and lose his job. He is sent to America to interview the world’s greatest stand up comedians. However, on his travels, James finds himself steering the interviews to his own interests, rather than that of the magazine’s. Through spending time with his former heroes, a faint glimmer of his passion for comedy that once stirred within begins to emerge. Circumstances leave James mugged and stranded in a desert town, where an impromptu stand up set allows him to find his comedy spark.